This is my mom’s recipe for Lady’s Finger Stir Fry. It is very simple and easy to prepare. It goes well with rice and rotis. Wash and clen the Lady’ fingers. Wipe them with a towel. Cut them into one inch pieces. Heat oil in a nonstick pan, put in onions and greenchillies. Saute it for a few seconds. Add turmeric and pepper powders. Also add the Lady’s finger and salt. Mix well and cover it with a lid. Cook on a low flame. Mix it very five minutes and again keep covered. Cook until it is tender. (Each time while opening the lid, make sure that the steam does not fall into the pan.) Now it is ready to be served! Welcome to my blog! 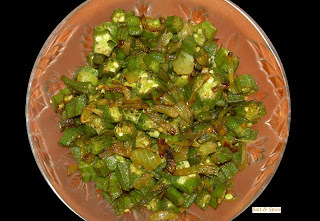 Glad to hear that you tried ‘Lady’s Finger Stir Fry’ and that it came out well. There are lots of simple recipes which you can try. Please try them and let me know about the outcome.